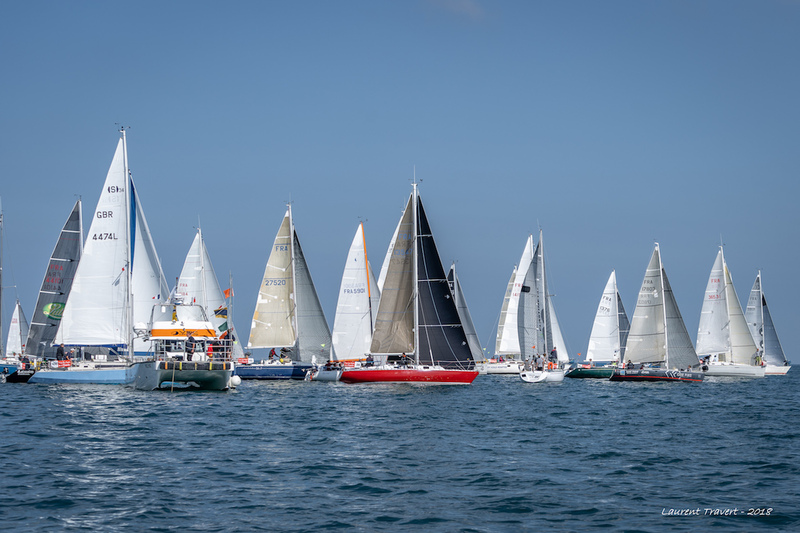 The final stage of the 34th Manche Ports Race was a marvellous ending for this 2018 edition. For the passage between Jersey and Granville the crews enjoyed the same perfect conditions as they have had all week. After 6 days of competition and 7 validated races, it was a perfect ending to the “Tour”, and we now know the winners in each group. On the pontoons, the feeling is unanimous: the 34th edition has been exceptional! It was a short leg but another sunny one. After leaving the Bay of Saint-Aubin the fleet glided under spinnaker towards the Minquiers reef and from there to the Ardentes buoy, the point of arrival for the race. The crews had a light breeze for this last race taking them to Granville. After the prize-giving ceremony, the crews will be able to enjoy a farewell buffet before they get a well-deserved rest. Another victory for the Auguin family. And what a victory! The crew of Pied d’Allouette have won group 1 in this Manche Ports Race practically unchallenged. Coming in first on each stage, the Auguins didn’t leave much room for any rivals. Behind them, Jean-Baptiste Le Goubey’s Folies d’Amour takes second place followed by Pacha, skippered by Olivier Guillon. In group 2, the duel between Axe Sail 2 and Oirrior continued until the very last day but the former won out. Coming in second on the final leg ensured victory for Marc Gadbin’s crew, ahead of Oirrior of course and François Hubert’s Monster 737, which, it should be remembered, won the last three stages. Robert Bregeon’s La Railleuse has done it again this year in group 3! After a tremendous win in 2017, the crew got back together for this 34th edition. The young crew of Idée Fixe, skippered by Martin Louchart, rank second followed by Défi Voile Adaptée, skippered by Thierry Fortin. In group 4, Gwaihir Venturi has made it! After finishing fourth in the Race several times, and second last year, Philippe Rios’s crew has – finally – won! Manche fibre Kunkel Palettes, skippered by Jan Legallet, finished second followed by the Rapetous, who had a very average start but finished the Race with three terrific stages. And finally, in group 5, no surprises! Axel Gadbin’s Axe Sail, magnificent, takes the top step on the podium ahead of Crédit Mutuel, skippered by Vincent Bunel and Ville de Donville, skippered by Benoît Défosse. “It would be hard not to be happy when you look at the sailing conditions we’ve had this week. We couldn’t have dreamed of better. We had a great time in these waters, there were strong currents and not much wind, an ideal combination for a stimulating race. We’ve won the event again but I think there’ll soon be a successor to beat us – I hope so, and I’ll be delighted. There are several boats with young skippers who are very accomplished sailors, and that’s good news for the future of the Manche Ports Race.” Christophe Auguin, crew member on board Pied d’Allouette, winner of group 1. “Lovely weather, lovely sea, great conditions for a race! We sailed well, and we’ve won the Race against both experienced crews and younger ones, who we can see are developing their skills very quickly!” Laurent Bregeon, crew member on board la Railleuse, winner of group 2. “La Manche is a peninsula surrounded by sea, so talking about sailing and showcasing our maritime assets is an obvious thing for the Département of Manche to want to do. The Département Council has spent the last two years developing a plan for the marine sector which involves showcasing our sailing areas, enhancing the infrastructure of our ports, developing professionalism in maritime activities and organising major nautical events. 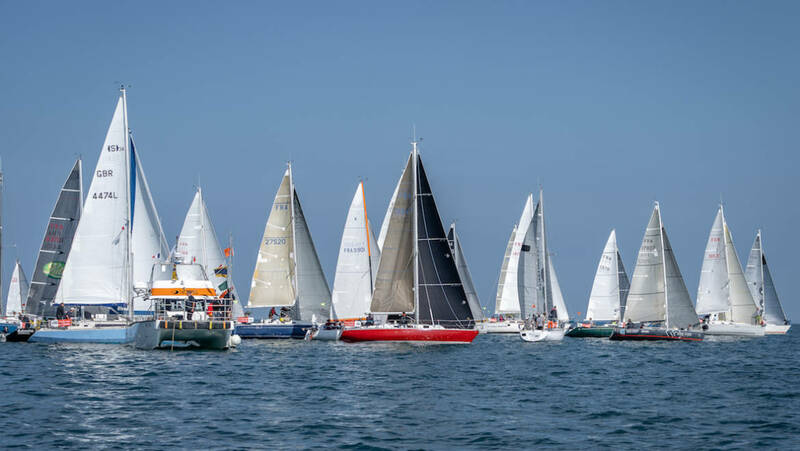 The Manche Ports Race, the Tour de France Under Sail, the Dhream Cup and the World University championship are four race events being held this summer, which demonstrates that we’re capable of organising major sailing events. Everybody agrees that the 2018 edition of the Manche Ports Race has been exceptional, and the Département’s commitment to this race is a good example of our desire to support events of this nature which serve to promote our coast.” Marc Lefèvre, President of the Conseil départemental de la Manche. “We said it at the beginning, and now we have proof, this 2018 edition of the Manche Ports Race has been exceptional! Sun, wind, a terrific atmosphere, we’ll remember this 34th. 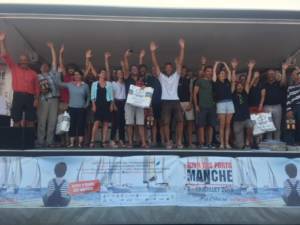 I’m delighted to see that Défi Voile Adaptée, the crew supported by the Manche Département Council, came in third. They battled right up to the end and they’ve proved that perseverance is often rewarded. I’d like to invite even more competitors to come for the 35th edition next year. I’d also like to thank the organisation, the many volunteers and of course the staff of the Manche Département Council. They’ve all contributed to the success of the event!” Marie-Pierre Fauvel, Vice-President of the Manche Département Council, responsible for sport.